Mrs. Helen Brown arrived at Creekside Center for Rehabilitation and Healing on September 15th, 2018. She arrived to us from St. Thomas Midtown, a local hospital located in Nashville, Tennessee. Mrs. Brown was brought to us with respiratory failure and a humerus fracture in her left shoulder. After being admitted into the hospital due to her diagnosis of respiratory failure, Mrs. Brown was informed that she would need to begin her rehabilitation journey in a skilled nursing facility. Mrs. Helen Brown arrived in a sling because of a fracture in her shoulder. This fracture was non-weight bearing. Additionally, Mrs. Brown could barely stand on her own due to compromised respiratory support and decreased activity tolerance. She was very weak and shared that she did not want to do much with therapy. After our therapy team worked with her and encouraged her to participate with them, she began to see improvements. When Mrs. Brown saw improvements, she was more motivated to work towards a potential discharge home! Our entire team at Creekside were elated and motivated to continue ushering Mrs. Brown towards her goals. Within the short amount of time that Mrs. Brown has been with us, she has made dramatic improvements. When she was first admitted, she couldn’t stand on her own. As time went on, she progressed to being able to ambulate to the gym and make an entire lap around our community here at Creekside Center. When Mrs. Brown first began receiving therapy services, she was using a walker; now, she is able to ambulate with just a cane! Formerly very compromised in terms of her respiratory capacity, she is beginning to build her stamina, allowing her to spend greater amounts of time with our therapists and work on strength building. Although Mrs. Brown is a current patient with us, she and the therapy team are continuing to work towards a safe discharge plan in the near future! We cannot wait to see the accomplishments she will make in the near future! Posted in Uncategorized	| Comments Off on Nursing Home Week 2018! The Creekside Center community was proud to welcome local healthcare professionals for an eclectic evening of wine pairings, live music, hand-rolled cigars and great fun! Creekside Center appreciates those in the community who support patients and their families in the Greater-Creekside region. Thank you to all those who joined us! Our community was honored to welcome professionals from across the area to our CEU event in support of those in the vascular and diabetic communities. The goal of the informational seminar was to provide education on amputee care through our signature Comprehensive Amputee Rehabilitation Program lead by Paralympic Gold Medalists, Todd Schaffhauser and Dennis Oehler. With over 65 attendees, the event was the first of many educational seminars to follow for 2018. 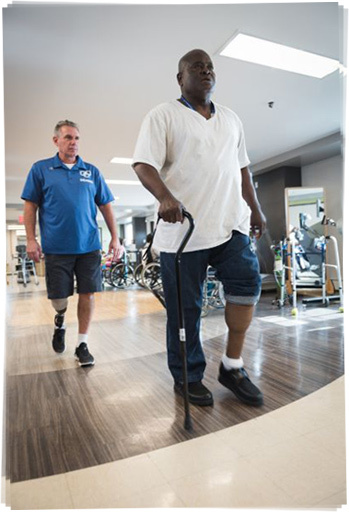 To learn more about our amputee support program, please click here! 11:30 – 12:30 pm Geriatric Council of Williamson Co.
Vanderbilt University Wound Professionals Conference. Posted in News and Events, News and Events, Uncategorized	| Comments Off on Coming Soon!